Despite qualifying for next year’s UEFA Nations League Finals, Liverpool defender Virgil van Dijk insists their primary focus is Euro 2020.
van Dijk scored a late equalizer in their 2-2 draw against Germany on Monday night to make sure Netherlands finish top of Group 1. The Liverpool center back is happy with their performance in the UEFA Nations League but says they are more concerned by Euro 2020. “It’s a fantastic feeling. We should all be proud of ourselves. 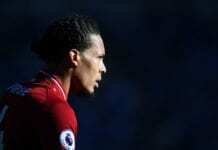 I know I am,” Van Dijk told UEFA.com, as cited by FourFourTwo. “It’s just a great feeling for all of us. “We worked so hard every game and to get rewards for that is fantastic. “Hopefully [the future] holds a lot, but we don’t like to look too far ahead. We want to qualify for Euro 2020, that’s the main target.